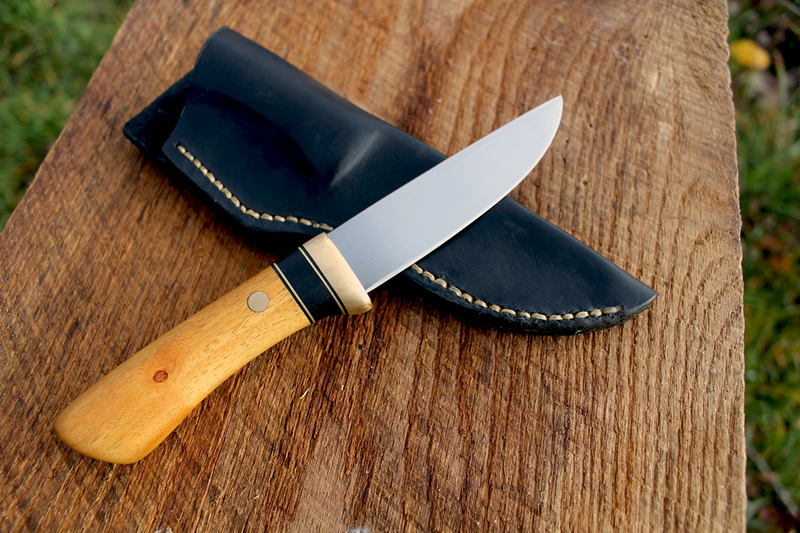 New knife, and new materials. 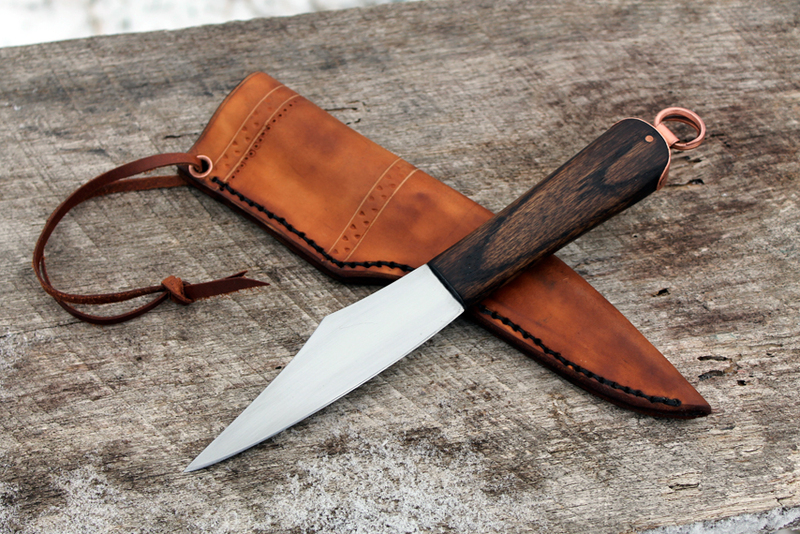 Here is a little knife I just finished up. 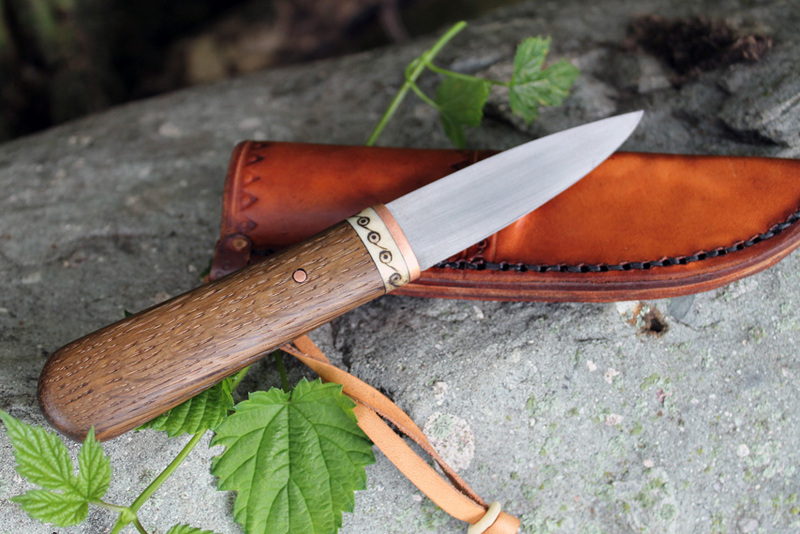 It’s got a 1095 blade with a nice distal taper, and it’s pretty much zero ground, which means the edge is nearly sharp before you even hone it. 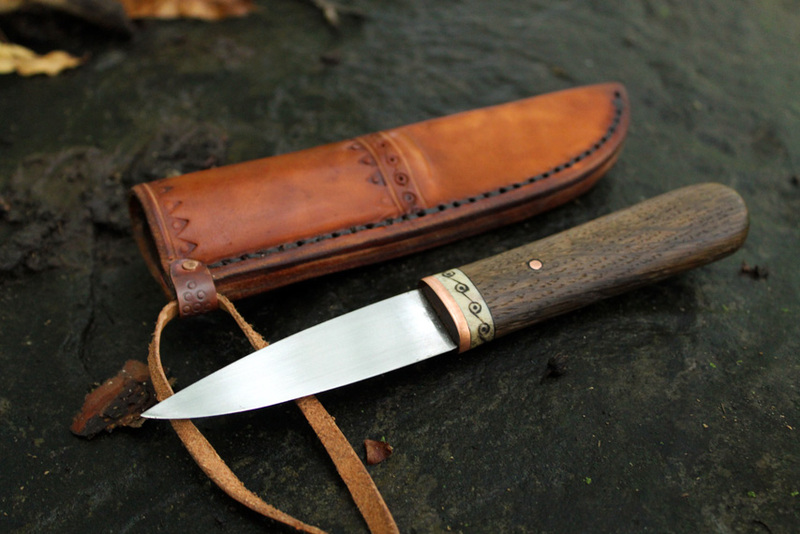 The handle is some Black Oak that has been sitting on the bottom of Lake Superior for over 100 years. When all the old growth virgin timber was being logged in the upper peninsula of Michigan and Canada there were a lot of logs that were lost to the bottom of that frigid water. Recently there have been people diving down and salvaging those long lost timbers. 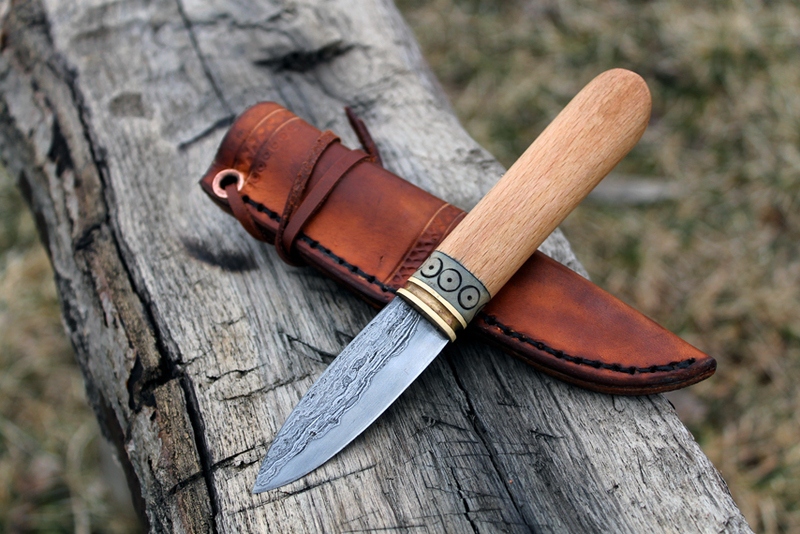 In addition to the Oak the handle has a piece of moose antler, with a classic ring and dot motif and a copper bolster. 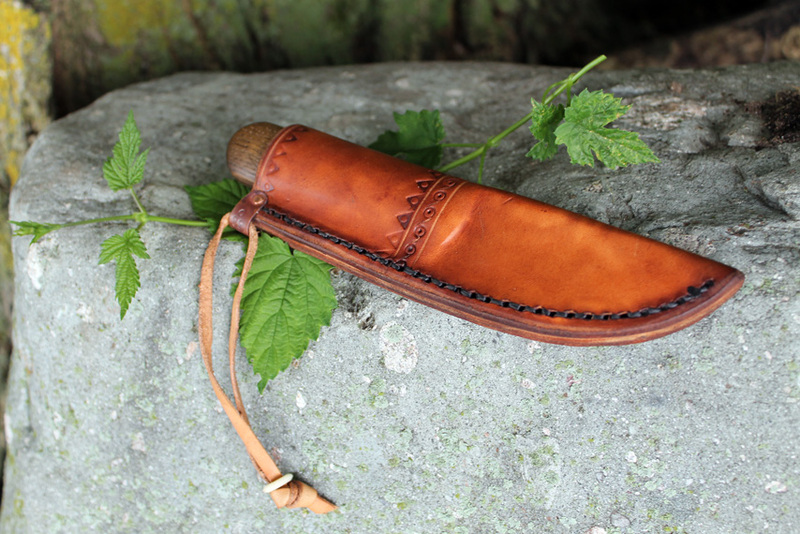 The sheath is hand stitched vegetable tanned leather, stamped with the ring and dot motif as well. 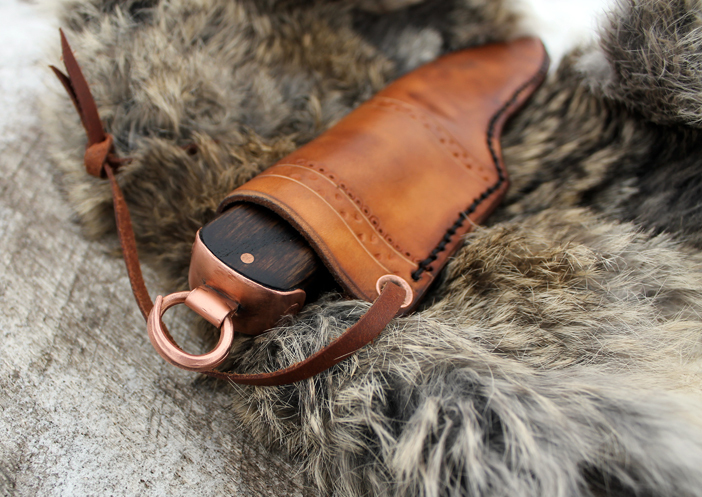 It has a copper reinforcement, leather hanger, and antler button. 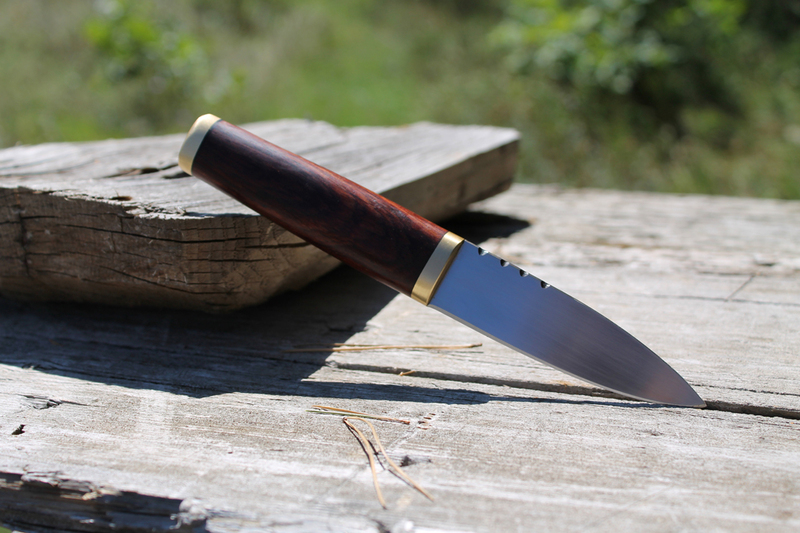 This knife is for sale. Please visit my etsy store for more information. 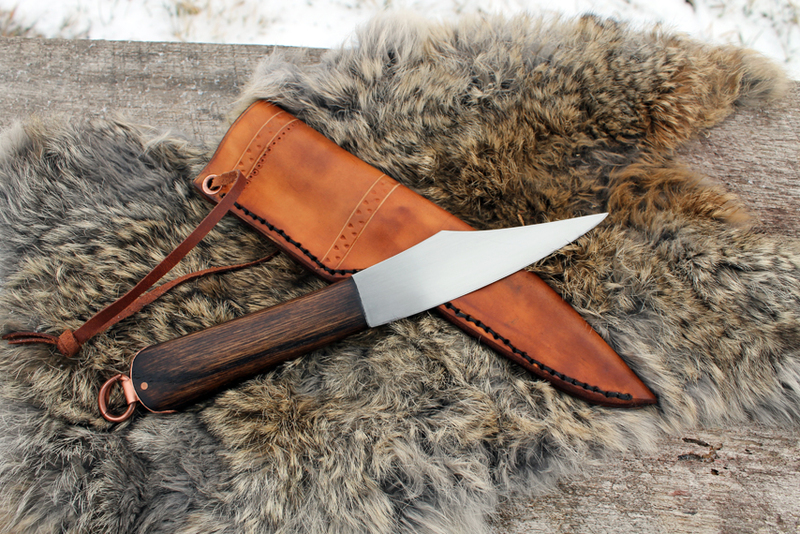 Several seasons ago I was asked by a customer to make an everyday knife for him. He’d be traveling all over the world, and needed something useful and reliable. 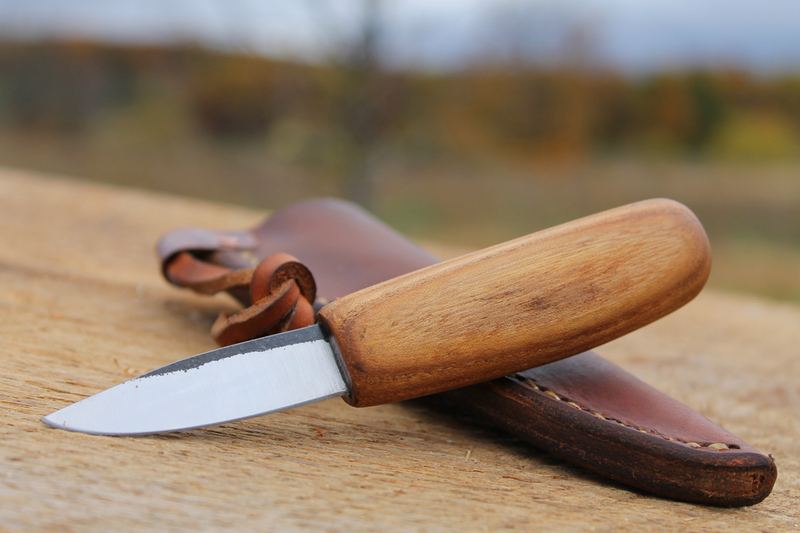 On his latest visit home he told me that, without realizing it he dropped his knife at the edge of a camp fire over night. 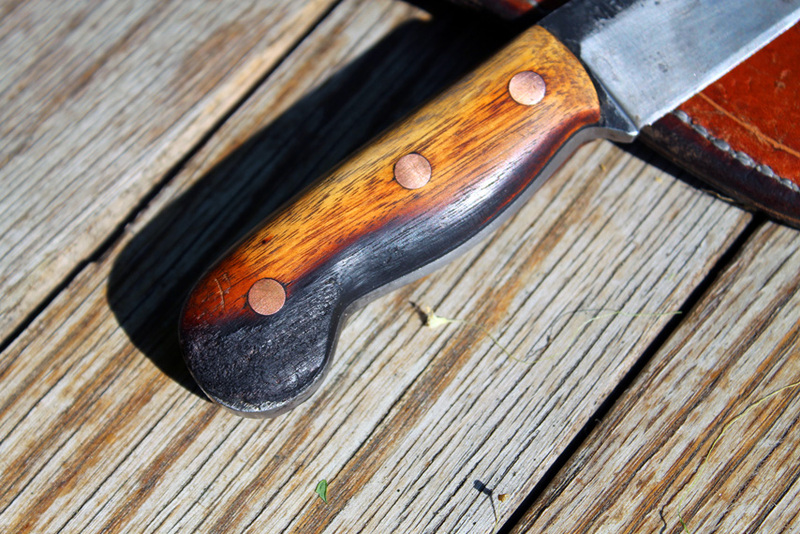 When he found it in the morning the handle was burned, but other than that the knife was in fine shape. 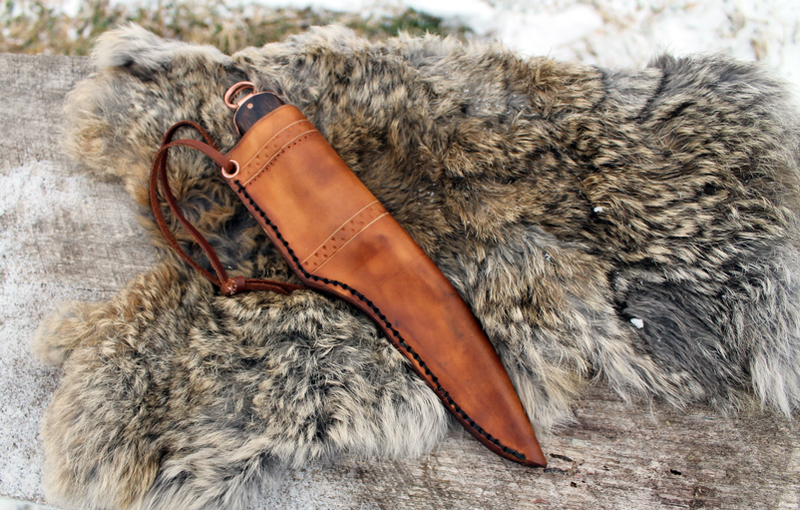 However, since the handle was smaller it didn’t really fit in the sheath anymore. 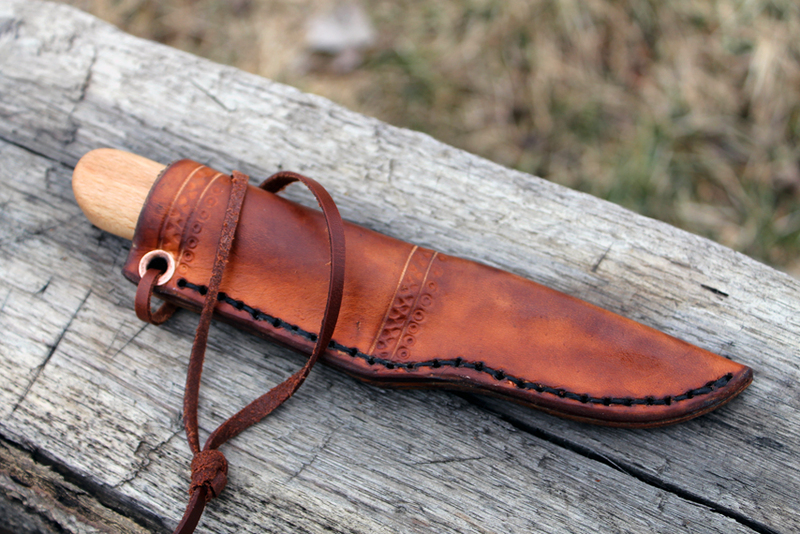 I made a new sheath for it, and sharpened it up. He wanted to keep the burned handle, and I’m glad he did. 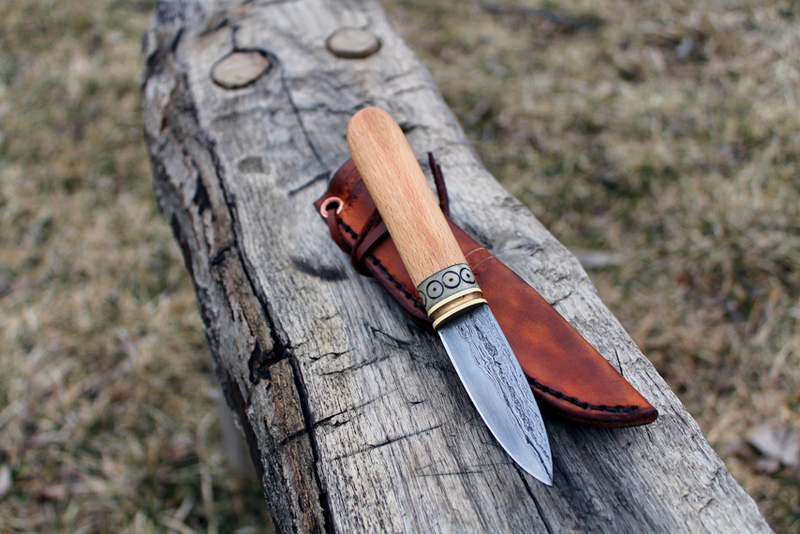 The wood used on this knife was Osage Orange, I chose it because it’s natural oils help it remain stable in changing climates. I never would have guessed that it would hold up so well to being in a campfire! Notice how the middle pin acted as a heat sink, the area right around it isn’t burned. This end, with the exposed tang can be used as a bottle opener now! 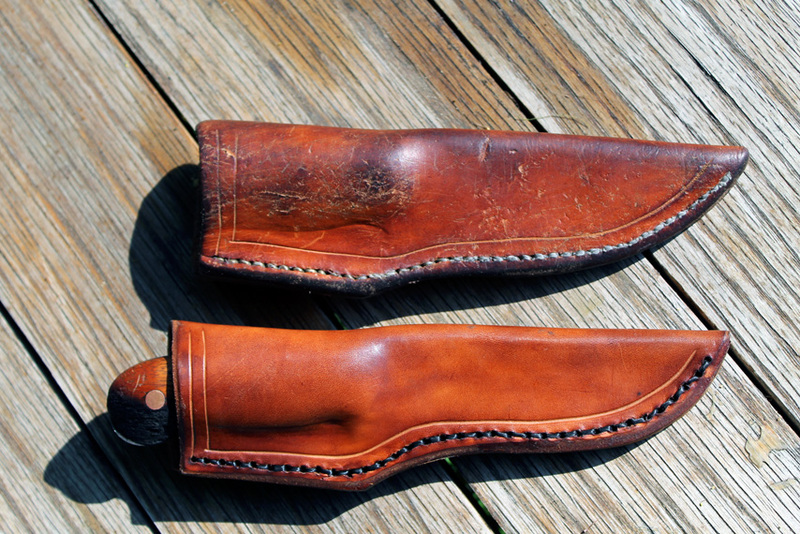 Here are the new and old sheaths next to each other. 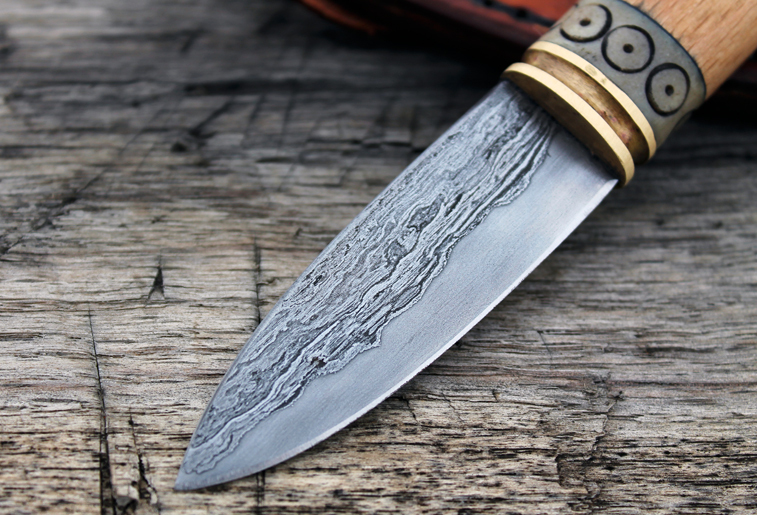 There is a certain aesthetic that I prefer for my knives, and part of my goal is to really develop my own voice in this craft. However, in order to truly find your style I feel that it takes years of experimentation. You must be open to new designs and techniques, or you will become stagnant. I suppose this goes for all aspects of life, not just craft. This summer and fall have been quite busy for me, in personal life, and work. 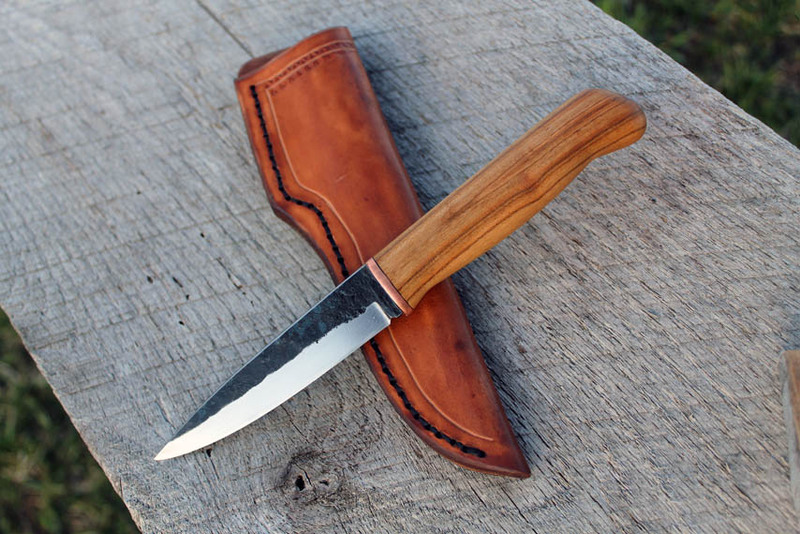 Here are a few knives that I completed from August to October. 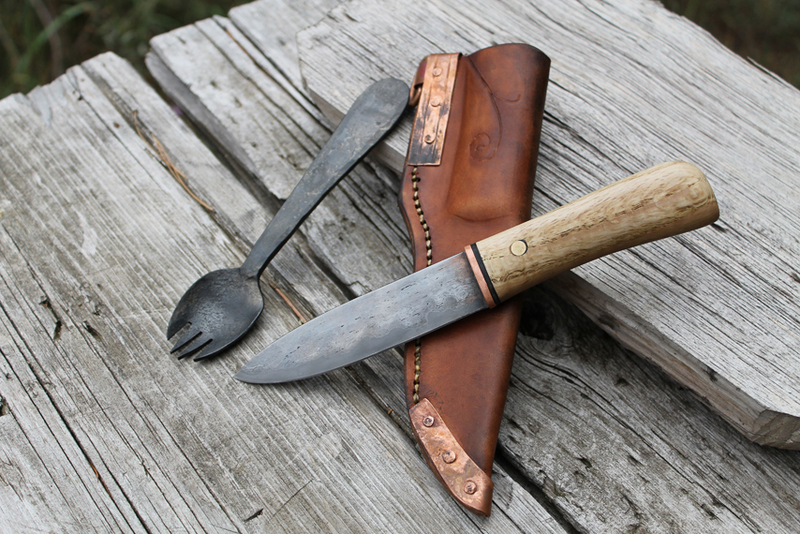 First up is a custom order for a knife and spork set. 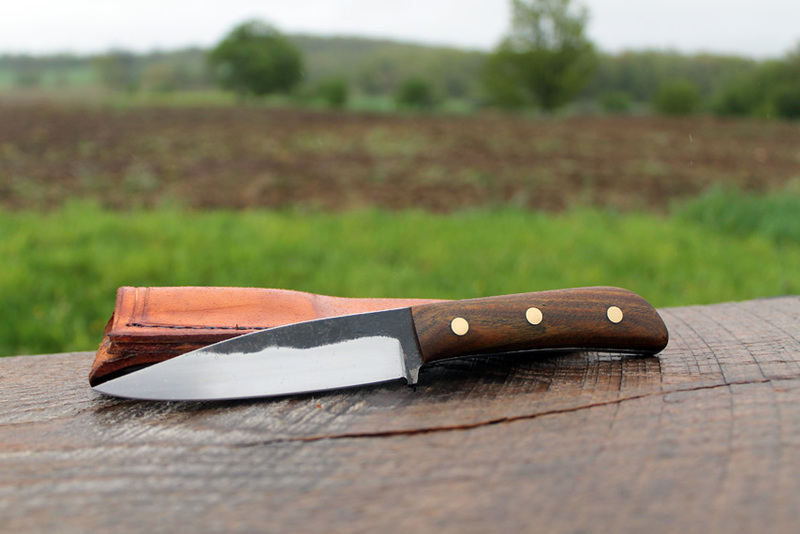 Laminated blade with curly oak handle. 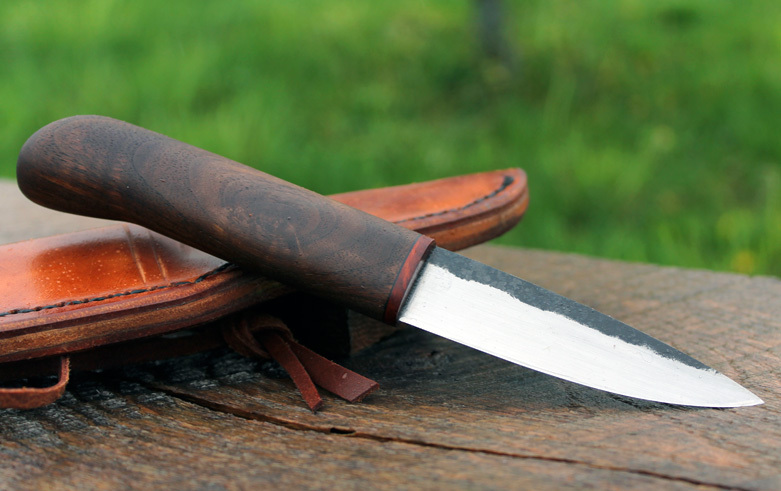 A traditional Scottish Sgian dubh that was made for a customer’s son’s wedding. 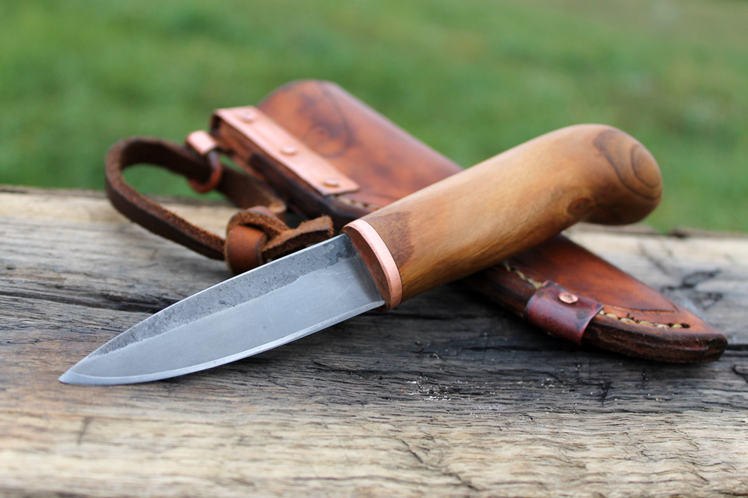 Much simpler, and cleaner than I prefer, but it was very rewarding to make. 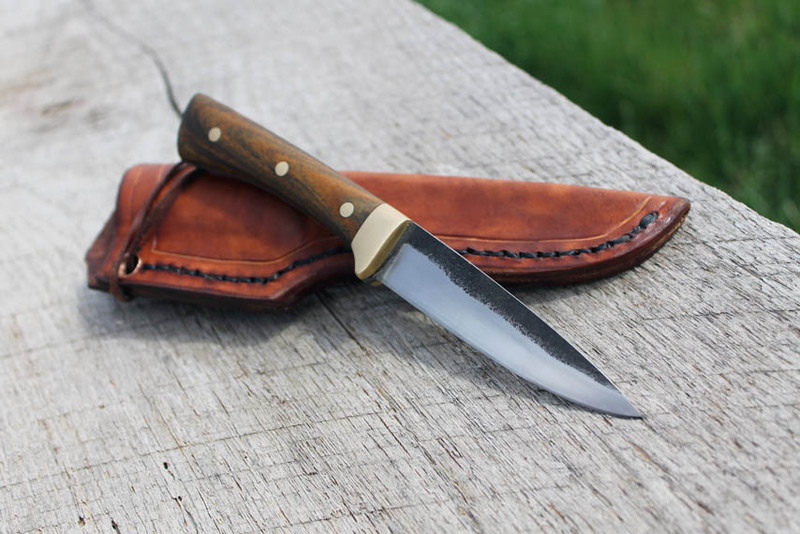 Here is a style that I love, I actually based it off of my own knife that I made myself many years ago. 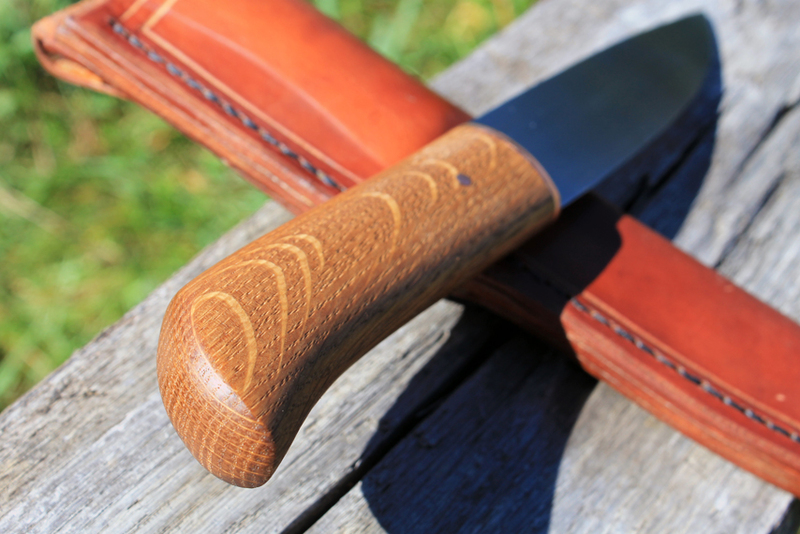 The handle is local peach wood. 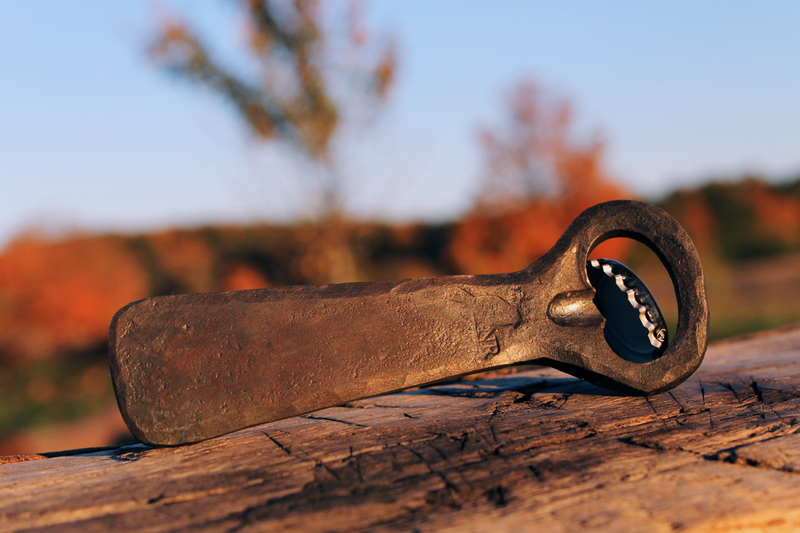 Being a blacksmith first I welcome jobs like this bottle opener. 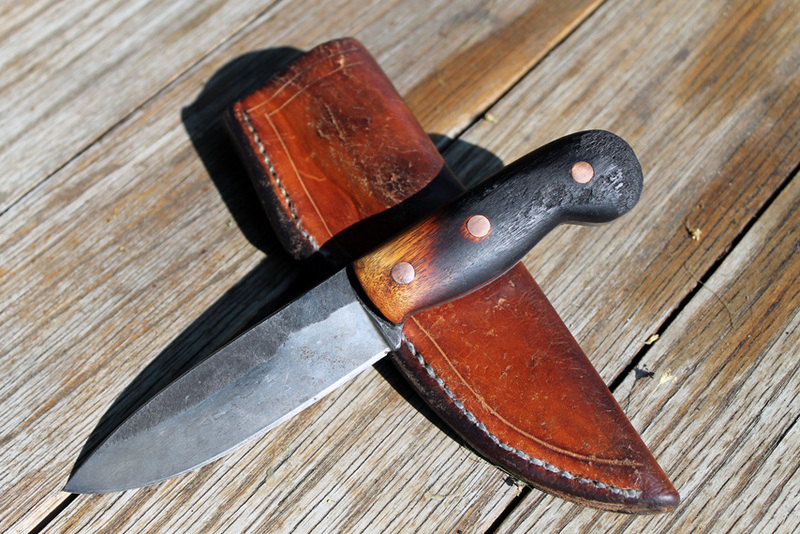 I always try to keep some less expensive knives in stock. 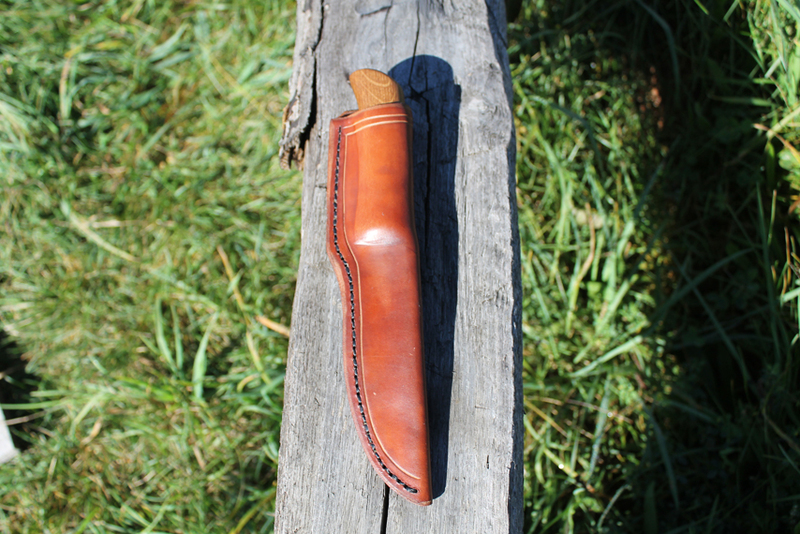 Here is another departure from my normal style, very clean, but hopefully it still has character. 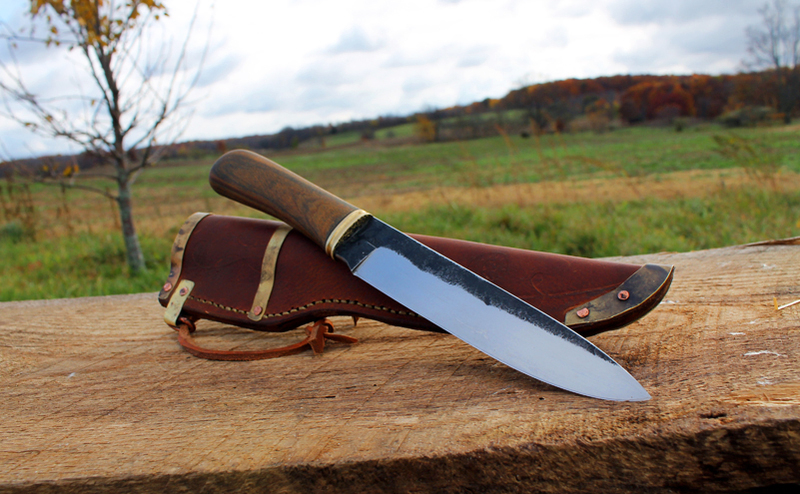 Finally a larger knife, somewhat of a camp knife. I’m experimenting with different size blades. 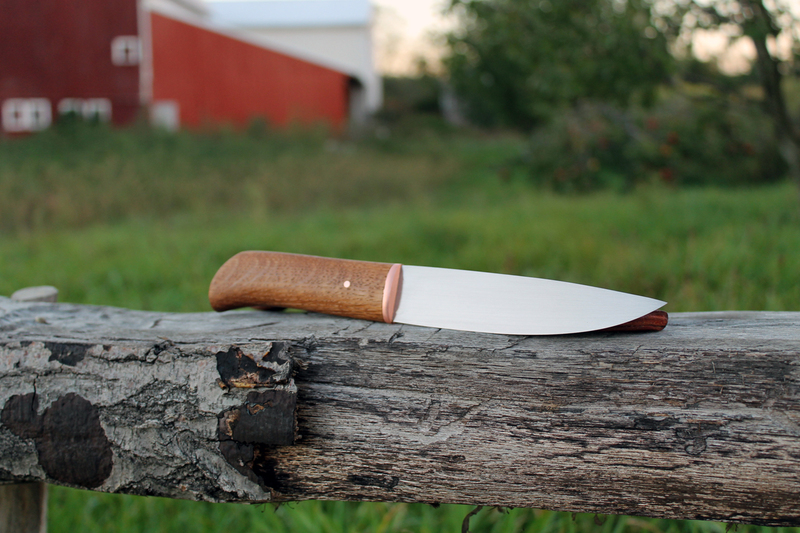 It is my desire to make a useful tool, and lots of big blades are far to fat, heavy, and have much too obtuse of a cutting edge. 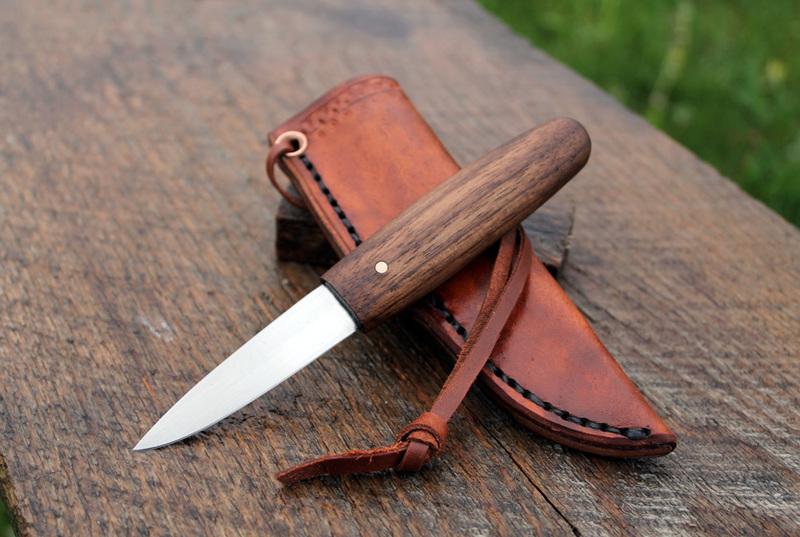 this one is durable, and light.